Hey everyone! The time has come. A little bit delayed, but I hope you can forgive me. The first edition of my collected documentation of visual guidance methods in level design is here! 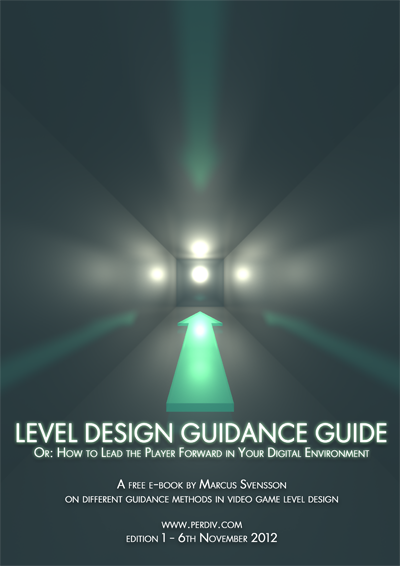 The Level Design Guidance Guide! The name is very much straight to the point, isn’t it? Click the fancy cover to download the guide today! If you like the guide, feel free to spread the word! As I mention in the guide, so long as the guide retains its form, I’ll be happy to see the word spread. Hopefully, it’ll be useful to some people. I wish you all a good read! It feels weird now that pretty much everything’s finished for this block. The only thing that remains is the presentation tomorrow. Well, I should get to training on my presentation.